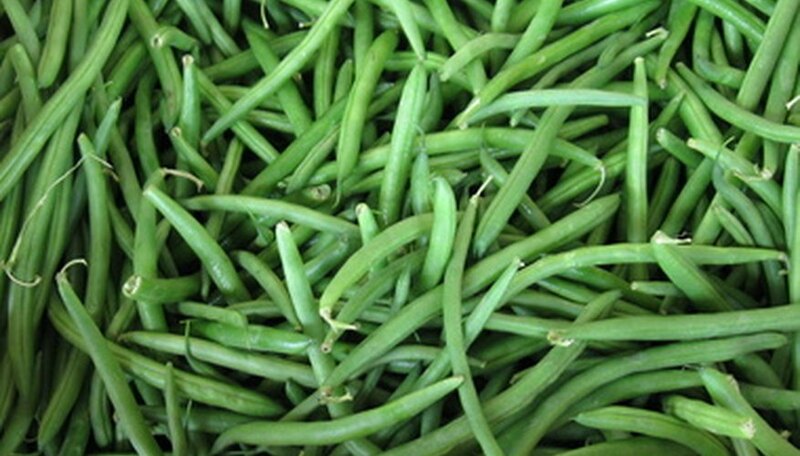 One of the simplest low-maintenance plants to grow in a summer vegetable garden is green beans. Once planted, they require no more than watering, but at harvest time they yield up a crop of beans that can produce for weeks. If you would like to plant green beans but assume it is out of the question because you don't have enough garden space, try planting green beans in a container. Select pole beans, as opposed to bush beans, as pole beans require only a pot, some poles and a lot of sunshine. Select a container that is 24 inches in diameter, such as a large pot or a half barrel. Ensure the container has drainage holes in the bottom. Fill the container with a commercial potting soil mix, and tap it down lightly. Take the 4-foot plant stakes and insert them into the soil so they make the shape of a teepee. The bottom of the stakes should rest against the inside of the bottom of the container, while the tops should meet in the middle. Wrap some jute twine around the tops of the stakes where they meet, to hold them securely in place, and then tie it off. Soak bean seeds in water for two hours before planting, as this helps soften the seed coat and promotes germination. To soak, place the seeds in lukewarm water and leave them on a counter. Plant four beans around the bottom of each of the poles. Plant bean seeds 1 inch beneath the soil, and lightly tap the soil down over the seed. Water the soil until it is moist up to 2 inches deep. Don't let the soil dry out while the beans are growing, but remember to keep the soil moist, not soaking wet. Place an inch of mulch on top of the soil to help keep moisture in, but do not apply mulch until the seeds have germinated, otherwise it may be difficult for them to break through the soil. Compost, manure or wood chips are all recommended by the National Garden Bureau, and can be found in nurseries or lawn and garden centers. Keep your pot in a sunny, south-facing window if indoors, or in a sunny area in your yard or on your deck. Harvesting beans as soon as they are ready can prolong your harvest season. Indoor containers of pole beans do not need to be watered as often as pots that are set outdoors. Over watering of green bean plants can cause the roots to rot.